Several reports in the news over the past week have highlighted yet again the importance of animal research to medical advances. The BBC reports that gene therapy has been used successfully to treat a patient with severe β-thalassemia. β-thalassemia is an inherited disorder caused by mutations in the β-globin chain of haemoglobin that lead to ineffective production of red blood cells and profound anaemia, and currently bone-marrow transplant is the only effective long term treatment for severe β-thalassemia. Unfortunately suitable donors are not easy to find, and in their absence patients depend on frequent blood transfusions that in turn lead to problems due to iron overload. Against this background the news that this disease may be treated by gene therapy in the future is most welcome. The team of scientists and doctors led by Dr. Philippe Leboulch, of Harvard Medical School in Boston, used a lentiviral vector, based on elements of the HIV virus, to insert copies of a functioning β-globin gene into the patient’s haematopoietic stem cells (HSCs), and then transplanted the modified HSCs back into the patient. Lentiviral vectors have become popular in gene therapy in recent years, indeed last year we discussed the use of a similar vector to treat the brain disorder X-linked adrenoleukodystrophy, and this popularity is due mainly to their improved safety compared to other vectors. Early trials of gene therapy for X-linked severe combined immunodeficiency (X-SCID) were called into question when several patients developed leukemia when the retroviral vector used integrated into a location in the genome that activated an oncogene – though ultimately the treatment was of great benefited to most patients – and research comparing retroviral vectors with lentiviral vectors in mice found that the latter had a much lower tendency to activate oncogenes and promote tumor growth (1). As Dr. Leboulch and colleagues point out in their Nature Biotechnology paper (2) reporting this work, research on mice was not confined to evaluating the safety of the lentiviral vector. Years of work went into developing and refining the β–globin lentiviral vector in mouse models of β-thalassemia and sickle-cell disease (also caused by a mutation in the β-globin gene) before it was ready to test in a human patient. Lentiviral vectors have proven capable of transferring these elaborate structures with fidelity and high titres (5, 6). Hence, several mouse models of the β-haemoglobinopathies have been corrected, long-term, by ex vivo transduction of haematopoietic stem cells (HSCs) with β-globin lentiviral vectors (5, 6, 7, 8, 9, 10). These advances have prompted the prudent initiation of a human clinical trial. The good news is that technology is advancing rapidly, and it shouldn’t be too long before diseases such as thalassaemia can be reliably and safely treated in this way. Another report from the BBC provides hope for the many thousands of patients on waiting on organ transplant lists; speaking at the British Science Festival Professor Steve Sacks announced the development of a treatment using the drug mirococept to protect the transplanted organ from attack by the immune system , a technique that could potentially double the length of time it survives in the recipient before a new organ is required. Currently transplanted organs last for about 10 years, and patients requiring replacement organs make up about 20% of those on the waiting lists. A small clinical trial of the technique indicates that is safe and a larger trial is now planned. Mirocosept works by blocking the activation of the complement system, a complex set of approximately 20 interacting enzymes and regulatory proteins found in the blood plasma and body fluids. The complement system plays a key role in fighting infection, but its activation is also a key early event in organ rejection. Mirococept consists of a complement inhibitor peptide attached to a second peptide that allows it to attach to cell membranes, thus enabling it to remain on the surface of the transplanted organ and prevent complement activation. 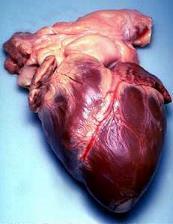 The human Heart, washing with mirococept may prolong its life after transplant. Mirococept itself was initially developed for the treatment of rheumatoid arthritis and ischaemia and reperfusion injury, after basic research in mice and rats demonstrated that the complement system played a major early role in activating the inflammatory response that is characteristic of these conditions, identified the key components involved in this response, and showed that blocking complement activation in several animal models could reduce tissue damage (3,4). Mirococept targets complement inhibition to specific tissues concentrating it where it is needed most and avoiding a more general inhibition that could leave the body vulnerable to infection, and performed well in animal models or arthritis, organ transplant, and ischemia and reperfusion injury (4,5). On the back of these promising results Mirococept has been taken into human trails for rheumatoid arthritis and organ transplant, where as we have seen it has proven to be a safe and reliable treatment. Larger trials to evaluate the efficacy of Mirococept are now underway for rheumatoid arthritis and being planned for organ transplants. The shortage of organs for transplant is a major challenge, and many approaches are being considered to increase the supply, I have written previously of tissue engineering to build new organs but it will be years before this technology is in widespread use. Until then I would urge you all to sign up as an organ donor, it only takes a few minutes and you might just save several lives. Our final story comes from the Autism Science Foundation, who write that a new drug named arbaclofen (STX209) improved the social interaction of autistic children, reducing tantrums and agitation, in an early clinical trial. Unlike existing medications that treat specific symptoms of autism arbaclofen acts to correct an imbalance in the levels of two neurotransmitters, glutamate and GABA, in the brains of autistic children. This new approach comes from studies of a mouse model of fragile X syndrome, a common inherited form of mental impairment and a cause of some cases of autism, which demonstrated that excessive activation of group I metabotropic glutamate receptor played an important role in the disorder, as discussed in an overview on the Seaside Therapeutics website. STX209 acts to reduce the excessive levels of glutamate released in the brain and therefore reduce activation of the group I metabotropic glutamate receptor, an approach which worked well in a mouse model of fragile X syndrome. 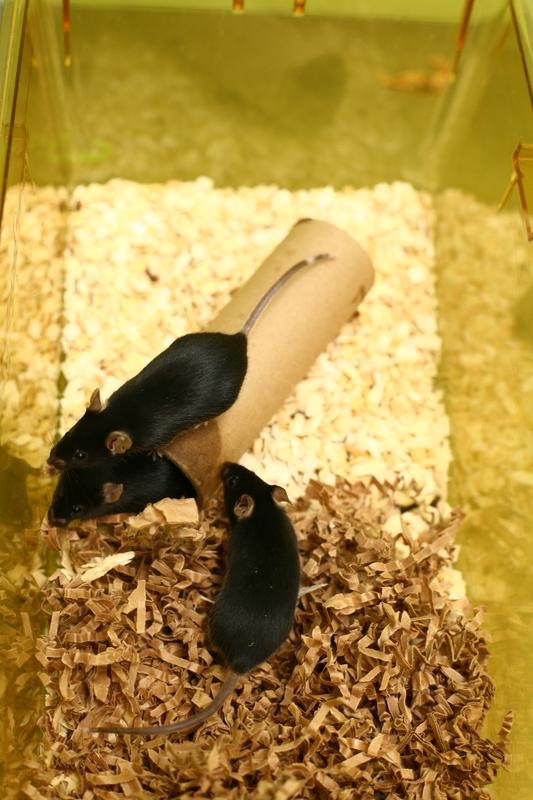 Mice, a valuable resource in autism research. Image courtesy of Understanding Animal Research. At a time when the parents of autistic children are bombarded with ineffective, ethically dubious, or downright dangerous “cures”, the development of a treatment that is both safe and effective is very welcome, lets just hope that it works as well in larger trials. So once again this week the medical news is full of exciting developments that depended on basic and applied medical research in animals, which is exactly the kind of work that Speaking of Research exists to support! Previous Previous post: Speaking Up: Who Does ‘No Comment’ Work For?